Iray Starter Scene: Post Your Benchmarks! Get the starter scene here. Or here, if you don't want to go to deviantart. This requires the Genesis 2 Female Starter Essentials and the DAZ Studio 4.8 Public Beta with the Iray content installed. It should require nothing else. If rendering CPU-only, or on a single older card, delete sphere 8 and sphere 9 as in the second scene shown. Iray is not slowed down much by refraction or reflection, but it is slowed down considerably by high SSS, and these spheres use versions of the "wax" and "jade" shaders DAZ included with the Iray Uber Defaults. Here are my own benchmarks with this scene, at the suggested 400x520 render size and the scene's included render settings. All are on 64 bit Windows 7. I do not yet have Iray-compliant drivers for the second machine's GPU (Nvidia appears not to appreciate my desire to use Windows 7 on my laptop), so I was unable to test that one. I don't have the patience to let Iray run any longer... need to use the computer for something else. I don't have the correct video card drivers to attempt to render the scene in GPU mode. AMD FX-6300 - I forgot the speed. I think it is 1.4 GHz or something. For those rendering on older cards or going CPU-only, delete the two spheres labeled "sphere 8" and "sphere 9" in your scene tab. Iray is not lagged very much by reflection or refraction, unlike 3Delight, but it IS lagged by lots of SSS/transmitted color. I will change the first post to reflect this. This means you'll want to avoid using the "jade" and "wax" shaders include with the Iray Uber Defaults, but the metal, glass, water, car paint, etc. are still very fast. My slowest-rendering setup, the quad core on this laptop in CPU only mode, sped up to 14 minutes at 95% on this scene without those two spheres (it was almost an hour and a half before!). It looks like this (attached) in case anyone is confused which spheres 8 and 9 are. Computer specs: Mac Pro running OSX 10.9.5 with a 3.5 GHz 6-Core Intel Xeon E5, 32 GB RAM, and dual AMD FirePro D500 3GB graphics cards. CPU only render (for obvious reasons): 15 minutes 40 seconds to reach 90%. 33 minutes total. 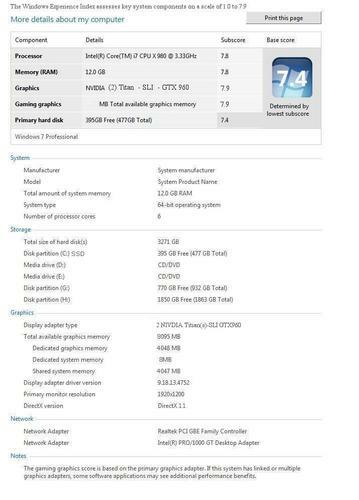 [EDIT] These numbers are for the original benchmark file. Not the suggested removal of the spheres. Thanks to everyone participating so far! both cards are dedicated to GPU render with the displays driven by a third card. Note how close the iteration count is for the three results. Also, I'd like to point out that the 740 is also driving two monitors with resolutions of 1920 X 1080. These numbers are for the modified scene, without spheres 8 and 9 (I hit the 5,000 iteration point before finishing with them present). OK done :) Using CPU only. Laptop= I7, 2670 2.20 GHz 4 Core - 90% = 38 min. and finished in 1 hour 36 min. Desktop= I7, 3770 3.40 GHz 4 Core - 90% = 20 min. and finished in 51 min. And I had mail, ICQ, and FF running on both machines if that makes a difference. I think those are fair times for a render. Thanks for posting the test scene SickleYield. A real eye opener for me, as it appears times are best using CPU + 2 (puny) GPUs. The test scene looked pretty good/slowed down around 3000 iterations. Looking forward to see DAZ's GPU offerings. edit: Test Scene rendered the full 5000 iterations, unmodified. Thanks for starting this thread, it is interesting to see the results. I don't know if the difference between GPU only and GPU with CPU is significant, but it looks like in some scenes the hybrid approach may be fastest. I'll play with some more I hate how fast my titin graphic cards spool up they sound like they gonna take off. @Lindsey: Rendering the scene, a single GTX980 no CPU clocked in at 5 minutes 51.16 seconds. I was surprised that it wasn't double, but I guess you lose a bit of efficiency having to split the job up between two (or more) cards. Anyway, the real question is whether a GTX970 would be that much slower, given that it is approx. half the cost of a GTX980, or better yet, two GTX970's instead of a single 980. Thank you for running that for me. I'll keep my eyes peeled for GPU discussions and be open to a pair of GPUs now that I just discovered there are GPUs work in PCIe x1 slots that I can dedicate for my primary video display. Maximum number of samples reached. My system is over 5 years old: Intel Core i7-920 2.67 GHz, 4 Cores, 8 threads. CPU only (with spheres 8 & 9 removed): 28 mins to 90% convergence, 63 mins total. Iterations: 4751 (which I guess is about the same for everyone). I am impressed that some systems can do this in under 5 minutes. I wonder if I can jam one of these Nvidia cards onto my old Asus motherboard, because over an hour for a relatively small and simple scene is not really an attractive proposition for me. Presumably if it were four times as large (800 x 1040) it would take four times as long. Thanks for this Sickle... I had some fun here. System: Win 7 with i7 6 core duo with (2) GTX660 2GB (960 CUDA cores each) and (2) GTX980 4GB (2048 CUDA cores each. I did the full scene and all went to 5000 iterations, just a moment before it hit 95% convergence. So the numbers are fairly linear based on CUDA cores if you take into account maybe about 30 seconds of processing and moving the scene to the cards. (just guessing here) For instance, one GTX 660 was 17:07 while two were 09:06. If you cut both of those by 30 to 45 seconds, you wind up divisible by 2. The 980s, 2 at 03:14 vs. 1 at 05:52... same sort of math. This is just how I thought it should be. Some really good information here! It's interesting to me that, while I had slowdowns with my CPU on at the same time as my cards, other people have mostly had a mild if not large boost in speed. Maybe I need to rerun that test and check for variables I haven't accounted for. Download that and post your results. It will report how fast your nVidia set up can crunch 3D. But more than anything else it should give you an idea about how fast you are compared to other users. My home PC with 2 GTX 980s scores 191. My work laptop with 1 GTX 780M scores 41. The battery of tests being run verify different kernels for rendering. Direct Lighting is a simple fast kernel, but it doesn't support caustics like glass. Path tracing is a full unbiased render. PMC is the same only more intense, because its optimized to resolve caustics better. Does that require a paid version of Octane,or is it standalone? I ask because one of Iray's advantages is that it's free, whereas the Octane plugin for DS costs $402 at current exchange rates. No. I'm not recommending the purchase of Octane if you aren't interested. I'm recommending that you use a standard GPU test. For instance you may not be cognizant of what many of the issues are with GPU rendering and therefore not stressing it out. In general I've found that performance on my PC and video cards has followed all the standard benchmarks. I asked a guy to run the Octane Benchmark on his PC and it scored him at 4.85. Clearly he'll benefit from a GPU upgrade. A GTX980 is $500US, and scores 90. A GTX970 is much cheaper ($300?) and I bet it only scores 20% less. I see your point, and it's fine if people want to do that, but that isn't really the purpose of the thread. It's more to see what different systems do in this specific engine. I wanted to do this because there's been some confusion about how different kinds of hardware handle Iray rendering, and I wanted to set up a standard scene for purposes of comparison in-engine. 64 Bit Windows 7 Professional. Still had a long way to go I think. Obviously Octane can't help with CPU only rendering, but Lux/Reality does. It just boils down to RAW CPU horsepower. The king there is cwhichura. His 20 core beast is about 4 times faster than any top of the line new PC. If you have a performance number for a render with a particular processor, then you can look up its benchmark and look up the benchmark of a different processor, and draw the correct conclusions. So... looking at Wilmap's performance numbers there my PC should be 50% faster. However I happen to know that i7-2600k's can overclock like crazy, and I know I'll barely match it for speed (I also happen to have a PC like that). His 560TI scores 37 on the Octane Benchmark, and a single 980 GTX scores 97. So I should be able to render the same scene on the GPU 2.2 times faster? If Iray does multiGPU, then I can do it 4.4 times faster? I'm curious, but do you throttle your GPU while rendering? I mean slow it down so you can actually surf the internet without long pauses? Its an issue in Octane. Under full load, your PC becomes quite unusable with a single GPU and unthrottled rendering. I use the Octane plug in with my secondary GPU. I use both GPUs for final render. Lets see what I can post here. Full scene used in all cases. CPU+GPU: 11 minutes 33.47 seconds. CPU Only: 38 minutes, 18 seconds. CPU+GPU: GPU ran out of RAM and failed before render started. Render time posted under CPU Only. Thanks for joining in, Spooky! When the GPU fails does it crash your system? No the card just dropped out, which is what it is supposed to do. LOL It is also the reason people should include the CPU in their device list.